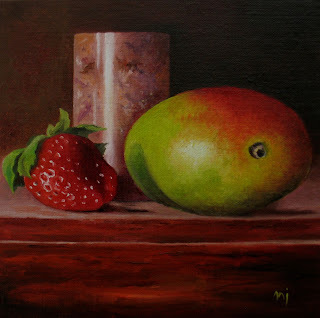 Oil on Linen Panel, 8" x 8"
Here is the little pink marble vase/pencil holder that I found at the thrift store the other day (along with my egg smoosher and some cake pans.) I thought it might be hard to paint the marble, but I think it looks marble-ish, yes? I'm pretty happy with this one, two afternoons in the doing. 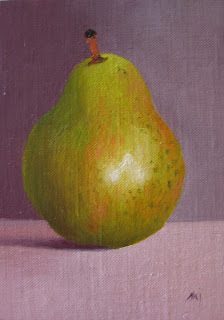 Oil on Linen Panel, 7" x 5"
A simple green pear today. Nothing fancy. 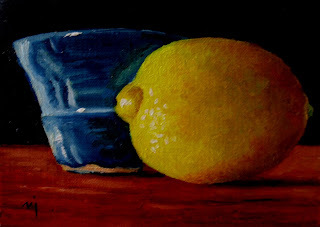 Oil on Linen Panel, 5" x 7"
Happy treasure hunting at one of the local Thrift Shops, called 2nd Avenue, on Friday afternoon netted me a egg salad egg-smoosher ( an old timey tool with square slotted openings in a round bottom), a neat little cotton tablecloth, a marble pencil holder, and this little hand thrown pot, all for under $20, yay! Here's the pot, posing with a lemon.